With spring training completed, my seven-year-old Charlie and his little league team played in their season opener, last night. A member of the Reds, he is so excited to finally be playing baseball games with his teammates. 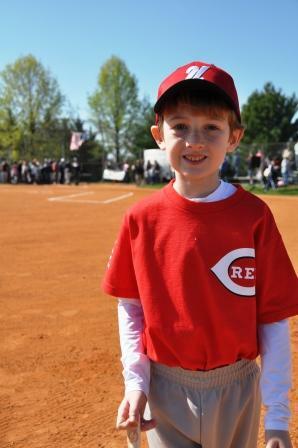 While I am thrilled to share golf and several other sports with Charlie, baseball has emerged as a special passion for him at this point in his young life. Charlie is already a student of the game. With the help of his little league coaches, he has practiced to improve his baseball swing, and for additional tips on fundamentals, he has watched Baseball the Ripken Way: Fundamentals of Hitting, a video by Cal Ripken, Jr. which he found on Netflix when looking for a flick for Friday family movie night. While I never played organized baseball and know little about the game, Charlie and I often go to the baseball field to spend father-son time. I certainly see similarities with his baseball techniques and my golf drills and understand the value of practicing correctly with goals. As an athlete, I also know he will inevitably experience hitting slumps and other disappointments so I am a constant cheerleader who praises his successes and offers encouragement when things don’t go so well. After watching countless junior golfers burnout over the years, I also try to help Charlie to just have fun playing. When I was a junior golfer, I spent hours and hours practicing purposeful drills, but the most fun was the endless time being a kid and playing imaginative games at the driving range or on the practice putting green. Like me at the golf course, Charlie has created some wild and crazy games that he can enjoy for hours on the diamond. Instead of making a putt to beat Jack Nicklaus in the Masters, he is playing alongside Derek Jeter to win the World Series. Quite literally, he throws himself around the field with reckless abandon… hitting line drives, sliding for bases, diving for ground balls, and throwing with all of the might of his 48 pounds. For Charlie’s participation in sports, my main goals are to help him learn about sportsmanship, and, above all, to have fun. I am so proud of him for his love for baseball as well as so many other things. Let the games begin! Tell me about your son or daughter: How do you offer encouragement with activities? How do you handle disappointments? Follow me on Twitter and join my Facebook page.